in exchange for an honest review. Thank you! I didn’t know this book was the second in a series until I’d finished it and at the end came across a blurb for Game, Set and Murder, the first book. So there you are. It stands alone. It needs no prequel and it ends neatly with no cliff-hanger. I like that. To tell the truth, the title (Dead Gorgeous) grabbed me because I do love a good vampire and/or zombie story, but the word “Dead” in the title here signifies what it used to signify before the vampire and zombie craze, and it is actually one of a new series of police procedurals featuring D.I. Angela (Angie) Costello. About whom, it has to be said, there is nothing particularly special or memorable. She is married to a retired policeman and has a grown-up step-daughter who returns home to live early in the story. A bit like Mr Wilkinson the clergyman. What I most enjoyed about the book was the setting, the London fashion scene. The author is clearly at home there but I was moving into a new world, and that for me is the acid test of a novel and a novelist. 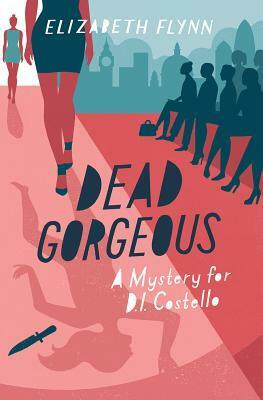 The eponymous victim is indeed “dead gorgeous” (though still alive) when the story opens. But though she looks like an angel, her character is far from angelic, and when she is murdered there is, as her flat-mate Sandra remarks, going to be no shortage of suspects.